This article originally appeared in the Grapevine, print edition. 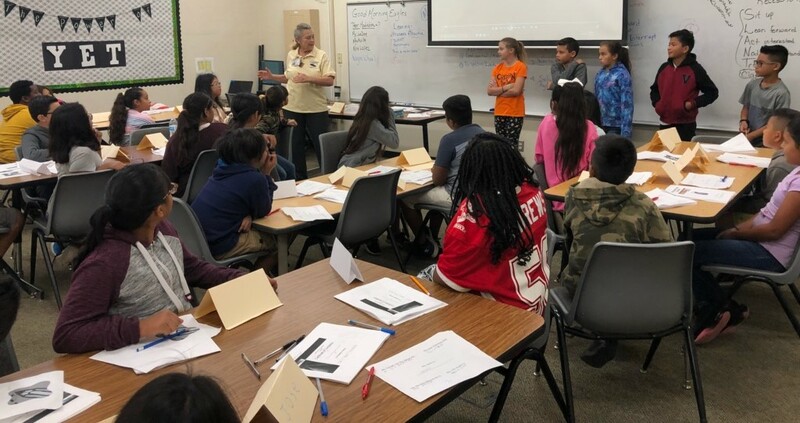 Washington Unified elementary schools are proud to partner with Fresno State University to train students to solve conflicts between their peers through The Peer Mediation Project. Through the project, University staff and students train elementary students to find peaceful ways to solve problems. Peer Mediators provide school-wide support during recess and lunch periods. Their services promote a safe and positive school climate so that all children to focus on learning. 25 4th and 5th grade students from West Fresno Elementary School and American Union were selected to receive training based on leadership skills, involvement in school activities, listening skills, grades, and staff recommendation. “The philosophy is that conflict is normal,” states West Fresno Elementary Social Worker, Crystal Avila. “With the appropriate training, we believe that students are responsible persons who can solve their own problems.” The program helps students identify and stop small disagreements before they become larger problems. Students are taught to show respect for diversity, maintain a “future focus” and seek mutual benefit when helping their peers solve conflicts.